We have the great honor to get to work with some of this industry's best artists, and for each beer festival Lou Dog Events produces, we bring on an artist who works in the craft beer scene to create a limited-edition shirt. We given them complete freedom, and sell the shirts until they're gone. They've created some pretty amazing stuff as a result. For this year’s Chicago Ale Fest, we partnered with Chicago-based artist, Adam Lundquist. His focus is on drawing, painting and printmaking, and printing t-shirts out of a make-shift screen printing studio in his basement. He’s got a BFA in printmaking from Southern Illinois University, and spends his time creating badass original prints, paintings, drawings, and wood carvings, much of which is inspired= by skateboarding, skateboard graphics, and rock & roll music. His shirt is detailed, complex and 100% Chicago. It’s called “Dibs” and depicts a scene familiar to any Chicagoan - someone holding their parking spot in the snow. Only in this version, and because we’re beer-nerds, the spot is being held by copious amounts of craft beer. 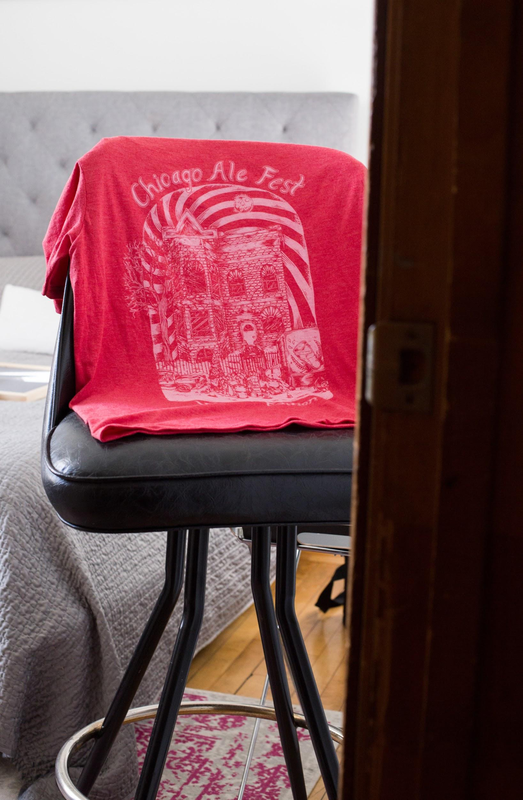 The shirt will be available in limited quantities as Chicago Ale Fest, so stop by and grab yours before it’s gone! Check out his work in his ONLINE SHOP (www.blanch.bigcartel.com) or on instagram at @qpblanch.